If you've ever visited Denver, and you love books, you've probably been to the Tattered Cover Book Store. When I first moved to Colorado I had never seen a bookstore like the Tattered Cover and I spent many hours in the old Denver store looking at, and buying, so many great books. They now have three stores, one on Colfax, one in lower downtown and the third in Highlands Ranch. If you haven't been, I have a reason for you to go - my wife's book, Sailing an Alien Sea, is now in stock at the Tattered Cover. I think we're going to go down to Denver this weekend just to see it for ourselves! Don't worry, if you buy the last one before we get there, we'll try again next week. Seriously, it's a really good book and it is getting great reviews. Out of respect for the Tattered Cover, I won't say where you can find those reviews right now, because if you're going to buy a book this weekend, go to your local book store and give them some love. If you don't live in Colorado, that's OK, your local book store can order it. That's Sailing an Alien Sea, by Cindy L. Gold, ISBN-13: 978-0988520004. In the past I have referred to my wife Cindy in this blog as "The person who prefers not to be blogged about." I also refer to her as "The Saint" for putting up with me as an entrepreneur, particularly in the early days of Gold Systems. Now, I can refer to her as "my favorite author." Cindy's first novel, "Sailing an Alien Sea" is now available on Amazon.com in both paperback and Kindle versions, and it can be ordered from your local bookstore. After almost five years of very hard work, she's got it done. I hope you will check it out, and buy it, because the early days of a new book are critical in building momentum. I know Cindy will appreciate it, and I will too, but I think you are really very likely to enjoy this book. The early reviews (both published and otherwise) have been great. It's a difficult book to categorize, so please just trust me and buy it. She's already getting repeat sales from people who have read it and then bought copies for a friend or relative. Back in October I wrote about my experience publishing on the Kindle ebook from Amazon.com. My wife Cindy had written a short story about our experience doing something called Blackwater Rafting a few years ago, and she donated it to me for my publishing experiment. I published it to the Kindle and mentioned it once on my blog, expecting that maybe one or two of my friends with Kindles would buy it. It’s only about 10 pages long, so I priced it at the minimum price of $1 and Amazon discounts it 20%. At 80 cents a pop, we weren’t planning on being able to fund a return trip to New Zealand. I think I get maybe 8 cents for each copy sold, but the joy that Cindy gets every time someone buys a copy has turned out to be worth way more than 80 cents. The experience, and the reaction from some very kind readers, has encouraged her to write more. Just a few weeks ago she finished the first draft of a novel. I’m biased, but I think it’s a great story. If you want to take my word for it, and you are an agent representing fiction novels, PLEASE contact me. I’ll get SO many points if I can help Cindy get her book published. And it really is a great story. So far I haven’t been able to convince her to let me publish it on the Kindle – she’s kind of traditional about some things. Thanks to everyone who bought Cindy’s story. If you haven’t yet, here’s another convenient link. I get double points if you go write a nice review on amazon.com. Once again, that link is right here and here, or you can just search for Cindy Gold on amazon.com Can you tell how proud I am of her? Cindy doesn’t read my blog, so let’s just keep this post between us, OK? Update 1: She found out about this post, and has called me "Ridiculously Supportive." I'm so lucky. I promised I would do an update after getting some experience with my new Amazon Kindle. After only a few days, it's pretty clear to me that I won't be buying many more books of the paper and cardboard variety. Before you write me off as a techie who doesn't get how important real books are let me say that I love books. If I had to choose between technology and books, I'd probably choose books. And I have a lot of books - I'm going to guess I have about 2,000 books between my bookshelves at home and work. I'll always love the books that where mine as a child, and books that were my dad's as a child. I even have some of my grandfather's books. No amount of electronics will ever replace them, so I get that paper-based book are important. I also love the random books that fall in my hands when I'm traveling, or that friends give me because they know that I will want to read them. So I love books, but mostly I love reading. I love the way that I can escape, and learn, and focus, and create my own pictures. And it turns out, I can do that without paper. After having spent a long weekend with my new Kindle, I just went and deleted all the books on my amazon wishlist that are available for the Kindle, but not before having Amazon send me a free sample of each to my Kindle. My iPod, and then my Zune and most recently my Zune Pass changed how I listen to music, and now I'm certain that the Kindle is going to change how I read. The think I like most about it is that it just works. Right out of the box, with only a few minutes looking at the user's manual and NO setup, and I was comfortable. Since Wednesday, I've read a novel and started a second, I've read copies of the Wall Street Journal, the New York Times and the Seattle Times, and I've listened to the first part of an Audible audio book while sorting laundry. I've read the Kindle everywhere I'd read a paper book. This afternoon I took it outside into the bright Colorado sunshine and compared the display to a paper book. The Kindle was easier on my eyes. When the light is low, I just make the font a bit bigger. When it's dark, I clip my book light onto the leather cover that came with the Kindle and the experience is even better than with a paper book. With a paper book, I'm always having to readjust the book light as it moves every time I turn the page. With the Kindle, I just touch a button and I'm silently on to the next page. One criticism of the Kindle is that the display is not back-lit, but they were trying to duplicate paper and I think they made the right call. I don't feel any fatigue from reading it, whether it is in bright sunshine or total darkness with a book light clipped on the cover. While you don't even need a computer to use the Kindle, and you can buy a book or magazine without a computer connection, you can connect it if you want and manually copy over any documents or unprotected ebooks that you already own. As a test, I went to the gutenberg.org web page and downloaded a Mark Twain book (it's public domain now and free) and I had no trouble saving it to the Kindle. 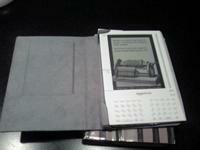 It occurred to me that I could also save music lyrics to the Kindle too, and that worked just fine. I've been working on writing a book of my own for about five years. OK, I haven't been working very hard at it, but this just might get me going again. Amazon makes it easy to publish for the Kindle and this might be the perfect format, or at least an interesting option for me. So, what could be better? At $399, it's not cheap. It's new though and I imagine the price will come down. eBooks are about half the cost or less of printed books, so in time I might make it back. I haven't dropped it yet, but it feels like it might break if I dropped it on to a hard floor. I was at a friend's house last night, and a good friend who loves books wouldn't touch it because she was afraid she might break it. It hasn't hung or done anything strange since I first turned it on and the (free) high-speed wireless connection has always been there when I needed it. I've found more than enough books that are available for the Kindle to keep me occupied, though it's a small fraction of the books in print. This will change though, and I imagine most new books will be available electronically. My first review was picked up by thekindleblog.com, and they seem to be collecting reviews, so check them out. Or as I've already told a couple of my techie/bookie friends - just buy it. I just happened to be in the bookstore as the newest, and last Harry Potter book was arriving.